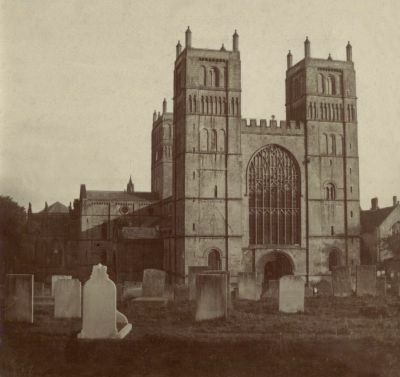 Alfred's favourite subject must have been Southwell Minster. In any collection I have seen, the minster always predominates. 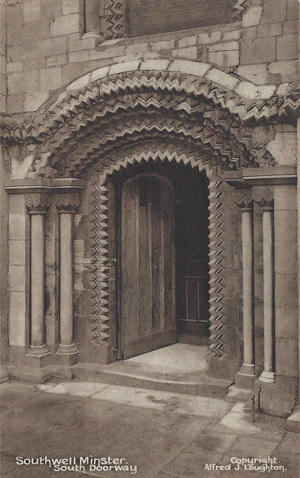 This page features external shots of the minster. 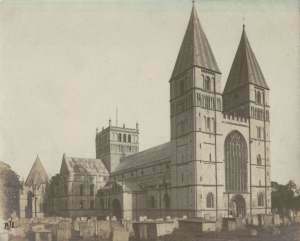 Southwell Minster without the pyramidal spires of lead fondly referred to as the pepperpots, which were added in 1879-81 and replaced similar structures removed in 1805. 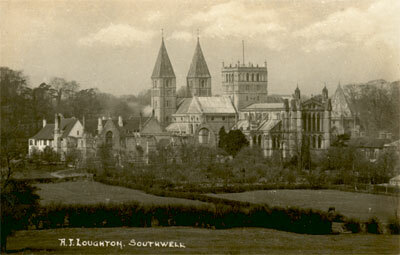 The front of a 1903 Christmas card featuring the Southwell Minster. Note all the gravestones which were latter removed. 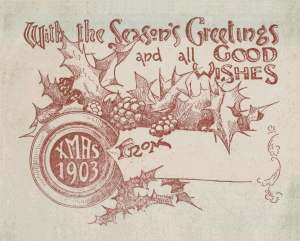 The reverse of the 1903 Christmas card. 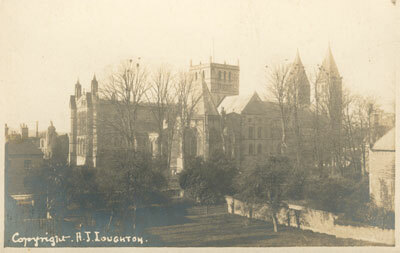 A postcard with a view of the minster taken from the south east looking over the Bishop's Palace. Not dated. 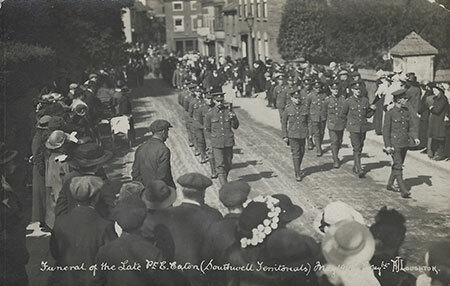 The same photograph as the one above, but notice that the writing is in a different hand and the sky hasn't been washed out. There has been much more care taken in the print processing making me believe that this one was printed by Alfred and the one above by an assistant. 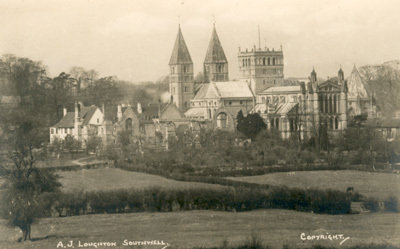 A postcard with a view of the minster taken from the north east. Not dated. 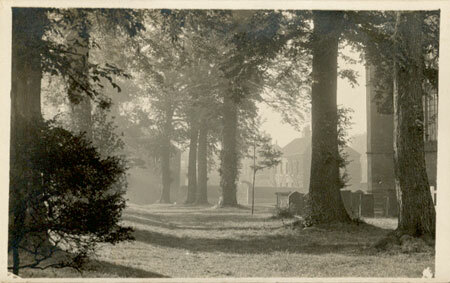 An early morning view along an avenue of trees on the north side of the minster looking east. Not dated. An ivy coverd Vicar's Court. 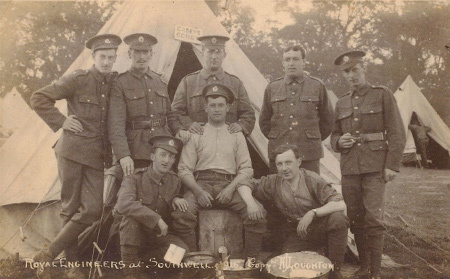 A postcard franked 8PM 24 July 1907. 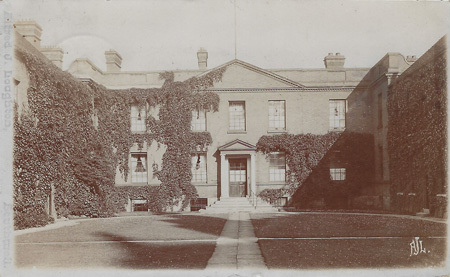 Sent to a Mrs Brookshank Kettlebank, Kimberly, Notts. "Dear L I thought you would like this Photo I expect you will know where it is you have scrubbed the steps a few times. Hope you are all well much love Lizzie"
I wonder how many times I walked through this door on my way to school services! 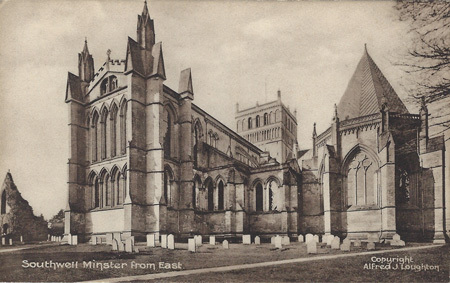 Showing the east end of the Minster and Chapter House. Shoot before the mass gravestone removal.